Patients undergoing breast augmentation are treated with multiple combinations of medications for pain control including ketorolac, liposomal bupivacaine, bupivacaine, and intravenous and oral narcotics. There is no current consensus on the optimal combination; therefore, all are used at the discretion of the surgeon. This was a single-center, retrospective study. The total number of patients included was 132. Comparisons were made between 4 groups: bupivacaine only (B); bupivacaine and liposomal bupivacaine (BL); bupivacaine and liposomal bupivacaine plus intraoperative ketorolac (BLKi); and bupivacaine and liposomal bupivacaine plus postoperative ketorolac (BLKp). Average pain scores immediately postoperative and before discharge were recorded and correlated to percentage of patients who received narcotic in the post-anesthesia care unit (PACU). Additional end points noted were side effects including nausea and time spent in PACU postoperatively. Those receiving intraoperative ketorolac had the lowest pain on discharge (P < 0.0001) and the lowest percentage of patients receiving narcotics (P = 0.009) out of all 4 groups. There was no significant difference between the 4 groups in terms of time spent in PACU, pain immediately after the procedure, or amount of antiemetic given. No bleeding complications were noted for those who did or did not receive ketorolac. When given options for pain control in breast augmentation, intraoperative ketorolac should be considered, because its inclusion was significant in decreasing use of narcotics and pain upon discharge. 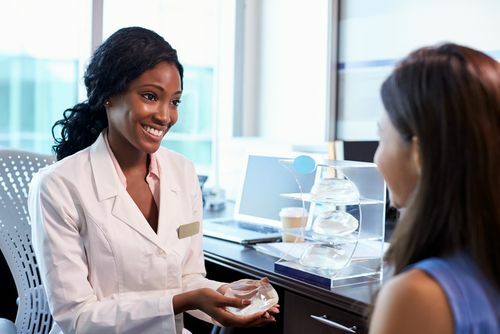 Addition of other costly drugs such as liposomal bupivacaine may not provide additional benefit in the immediate postoperative setting for procedures with a short recovery period such as breast augmentation.